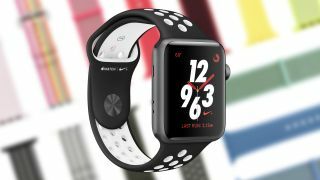 Apple has announced a fresh batch of straps for the Apple Watch, ushering out the wintery cold by injecting the ever-broadening lineup with some flashy options. Whether you’re in the market for a cheap upgrade or one of the more high-end bands, Apple’s latest additions seem to have you covered. All of these straps are compatible with the Apple Watch, Apple Watch 2 and Apple Watch 3. You can pick up a nylon-woven Sport Loop at $49 (£49, AU$79) in a few new colors, including Flash Light, Hot Pink, Marine Green and Tahoe Blue. For the same price, you might also fancy the Sport Band’s latest entries, which include Denim Blue, Lemonade and Red Raspberry. Woven Nylon, too, has been treated to newcomers, like Black Stripe, Blue Stripe, Gray Stripe and Pink Stripe – riveting names. The Nike Sport and Nike Sport Loop bands are set to make their a la carte debut, meaning you no longer have to buy the Apple Watch Nike Plus model to have access to Nike-branded straps. From a rosey-pink combo to more simplistic options like Cargo Khaki, and Pure Platinum with Black, it’s always nice to have more options. For those looking to make a statement, Apple’s got you covered with premium bands that pair nicely with the streamlined look of the Apple Watch. Starting with the $149 (£149, AU$209) Classic Buckle, that band is available in Spring Yellow, Electric Blue and Soft Pink. Of course, Hermes is present at the springtime unveiling, introducing new Indigo and Blanc options for the 38mm Double Tour at $489 (£489, AU$709). If you have the 42mm Apple Watch, you can pick up the Single Tour Rallye strap in those same colors as well starting at $339 (£339, AU$499). These straps haven’t yet hit the Apple Store, but keep a look out for them to launch later in March.